Our walk of Sunday 8 February 2015 takes place at the Troodos forest area. Troodos is the highest mountain of the island, with its highest peak (Hionistra) at 1950 metres altitude. Troodos is covered by a variety of pine trees, junipers, cedars and fir trees, and also presents the majestic golden oak, an endemic species to Cyprus, as well as a rich variety of bushes and wild flowers. 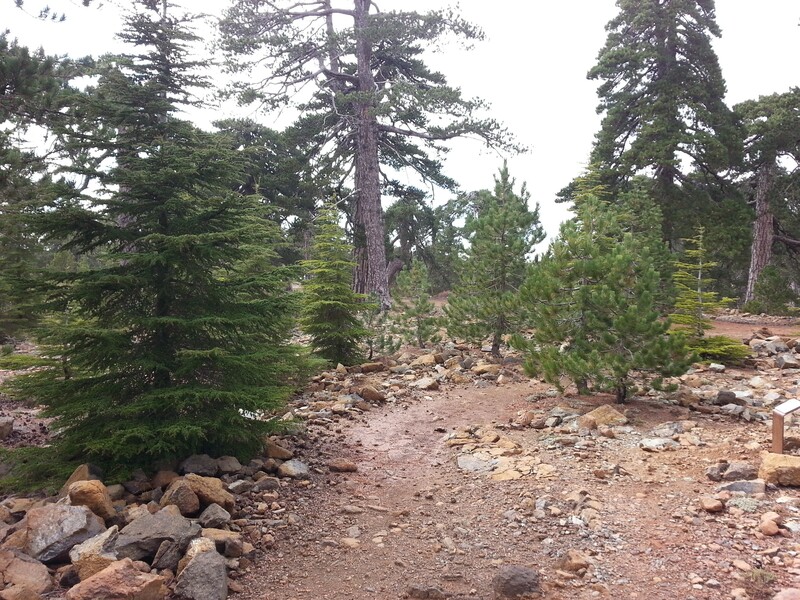 Troodos is also a rare geological phenomenon. The walk starts at 11:00 am. Xenophon is leading this walk, which will go ahead even in light rain; if you need to, call 97613720. The Artemis trail is a circular trail at an altitude of 1850 m. The walk will take close to 2 ½ hours and is classified easy to medium for difficulty. We follow well marked paths. The total distance is 7 km. The walk offers some of the most spectacular views Cyprus has to offer, at several places. At the end of the walk we shall sit down for lunch at a nearby taverna. Instructions will be announced at the start of the walk. We shall drive to the taverna in a convoy. You have the choice of meeting the group at the walk start, if you are very familiar with the place, or meet at the designated meeting point in Nicosia, from which we shall drive in a convoy. Meeting in Nicosia offers two important advantages: we drive in full cars, leaving some cars behind; thus, we save in fuel and enjoy the trip in good company. The meeting point in Nicosia is the very large church named tis Theou Sophias (also referred to as Agia Sophia) in Strovolos, which offers ample parking space on its side street. The car trip starts at 9:30 am. This is an earlier start time than originally announced, in an attempt to avoid the rain forecast for the afternoon. Please ensure you observe start times, for the benefit of the group. From Nicosia take the A9 motorway towards Troodos. The A9 smoothly becomes the B9 highway towards Troodos, when the motorway ends, near Kokkinotrimithia. Up on Troodos, follow the directions towards Hionistra, avoiding Troodos square, and driving towards the village of Prodromos. Two km down the road to Prodromos, observe the turning to the left, signposted to Hionistra. About 400 metres on the climb to Hionistra, you will observe the starting point for the Artemis trail on your left, carrying the usual wooden signage. Park your car on the side. We meet here. From Nicosia get to the junction between Cineplex and Apolloneion Hospital. At the traffic lights where you have the Cineplex on your left hand side and Apolloneion Hospital on your right hand side, zero your odometer and turn left. At the 0.3 km reading you see Lidl supermarket on your right. At the 0.8 km reading you reach traffic lights. Turn left. Immediately after you observe the very large church of tis Theou Sophias on your right. Just past the church (1.0 km reading) take the first turning to the right. This side street offers ample parking space. Park here. About the geology of Cyprus: The more widely accepted theory describing the geological formation of Cyprus refers to the subduction and plate collision of two separate tectonic domains, the northern Alpine orogenic belt, and the southern Eastern Mediterranean basin. The process is believed to have taken place in the Mesozoic Tethyan Ocean period (roughly, 90 million years ago). Key evidence in favour of this theory is the juxtaposed series of fragments of oceanic and continental crust, with oceanic crustal fragments preserved as ophiolite sequences, seen in various localities. About the geology of Troodos: Cyprus was created at a convergent ocean-continent boundary. Troodos was created when the African plate subducted under the Eurasian plate, partial melt took place and magma rose from deep inside the Earth (a volcanic eruption). Troodos is an ophiolite formed above a subduction zone. The crustal sequence of Troodos consists of plutonic complex, sheeted dyke complex and pillow lavas. Troodos is rich in several minerals, including copper, umbers, ochres, chromite and the lethal asbestos deposits. Copper is the predominant mineral and has been mined and exported since ancient times. Its chemical name in Latin (Cuprum) is said to be related to the name of the island (Cuprus). The Troodos Ophiolite Stratigraphy and subdivisions, from lower to top, are as follows. The Troodos ophiolite consists of 3 subdivided units: the structurally deepest but topographically highest Plutonic Complex; the overlying and surrounding Sheeted Dyke Complex; the stratigraphically highest Pillow Lava Series, which forms a discontinuous ring around the Troodos massif. On top of the ophiolite, we find the Umbers unit. Described in a 2-sequence division, the Troodos ophiolite is made up of the lower Mantle sequence and the upper Crustal sequence. See table for a schematic representation. Note that stratigraphy shows layers from sea-level downwards, into the earth; the diagram must be reversed, to depict the order in which one may find the layers on Troodos massif, given the way in which Troodos was formed. About Artemis: Artemis, in Greek mythology, was the daughter of Zeus and Leto, and twin sister of god Apollon. Artemis was the goddess of hunting and wild nature. She was often depicted carrying a bow and arrows. Artemis embodied the sportsman’s ideal, so besides killing game she also protected it, especially the young; this was the Homeric significance of the title Mistress of Animals. Her Roman equivalent is Diana.